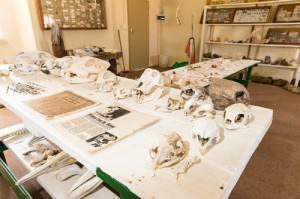 Learn about this extraordinary land, its people, its flora, its fauna. Namibia is an awesome land, rough and desolate, but incredibly beautiful, in its vast, moon-like landscapes and endless horizons. It is a photographer’s dreamland, a land of contrasts and earthy colours. It is not the place for those who like bustling beaches and the social whirl, but for those who are drawn to nature, stillness, the romance of the grandiose landscape, and vast expanses. 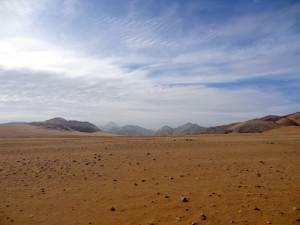 Namibia, is one of the least populated countries on earth for good reason. Survival is difficult for plants and animals; for man and beast. Survival is for the fittest and depends on adaptation to this arid environment, to all the tricks that nature can throw. 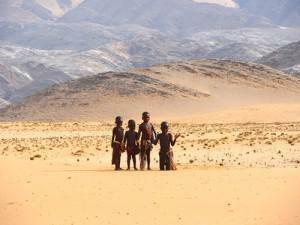 Because of its barren coastline, Namibia was one of the last parts of Africa to be colonized by Europeans. In 1883 a German merchant and adventurer, Adolf Luederitz from Bremen, bought the Bay of Angra Pequeña from Nama Chief Joseph Fredericks from Bethanien. He also bought the area in a 20 mile radius around the bay. With 250,000 inhabitants, Namibia’s capital is the largest city in the country and sits at an altitude of 1650 meters in a beautiful valley. Once there, we will be staying at the Olive Grove, a small boutique hotel. We may have the opportunity to visit the sights of Windhoek before dinner. Much of the town’s interesting architecture dates back to German colonial rule. Places to visit include the “Tintenpalast” (“Ink Palace”), which houses Namibia’s parliament, the Christuskirche (Christ Church) of the Lutheran parish from the year 1896, the “Reiterdenkmal” from 1912 and the “Alte Feste” (Old Fort); former headquarters of the Schutztruppe and today, Namibia’s National Museum. Since 1997, the monumental Supreme Court building has overshadowed the historical buildings of Windhoek. On day 2 we will board a private aircraft for a 1½ hour flight to the area of the Etosha National Park, one of Southern Africa’s finest and most important Game Reserves. 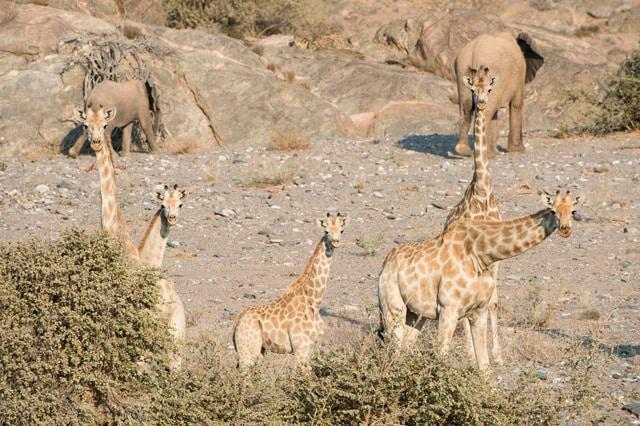 Etosha Game Park, covers an area of 22 270 square km, and was declared a National Park in 1907. If you like either statistics or animals, it is home to 114 mammal species, 340 bird species, 110 reptile species, 16 amphibian species and, as is much quoted “only one species of fish”, which no one seems to be able to identify. accommodation was designed and constructed with a unique combination of canvas, wood and glass. Each room has large glass windows and the doors slide open onto a private deck, offering superb views of the surrounding bush. The en-suite bathroom includes a shower with glass walls from floor to ceiling. A room with a view, bringing the outdoors inside! 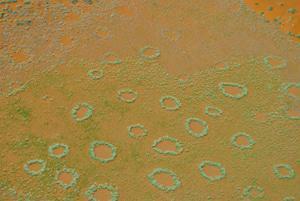 “Etosha”, meaning “Great White Place”, is dominated by a massive mineral pan. 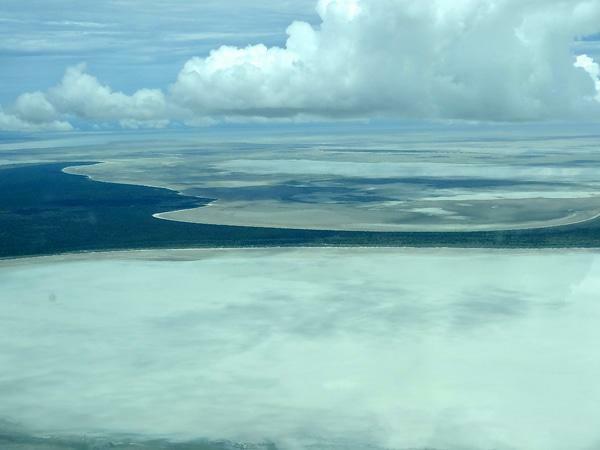 The Etosha Pan covers around 25% of the National Park and was originally a lake fed by the Kunene River. The course of the river changed thousands of years ago and the lake dried up so that the pan now is a large dusty depression of salt and dusty clay, filling only if the rains are heavy and even then holding water for a short time. The crystallized salt left behind from the waters shimmers in the sun and gives it it’s famous, eerie beauty. Temporary water in the Pans attracts thousands of wading birds, including impressive flocks of pink flamingos, while the perennial springs along the edges of the Etosha Pan may draw large concentrations of wildlife, including zebra, elephants, giraffe, as well as birds.Visitors to Etosha Game Reserve can expect to see many species of birds, plus buck, elephant, giraffe, rhino and lions. 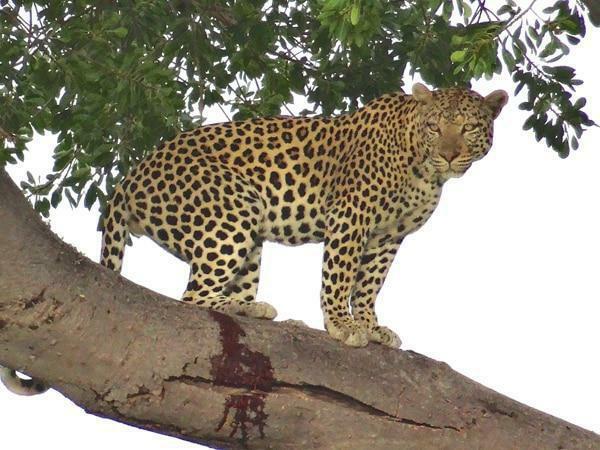 Fortunate visitors will also see leopard and cheetah. Our time will be spent on early morning and late afternoon game drives, and otherwise on bush walks or lazing around the pool. This is one of the most spectacular landscapes in the world. 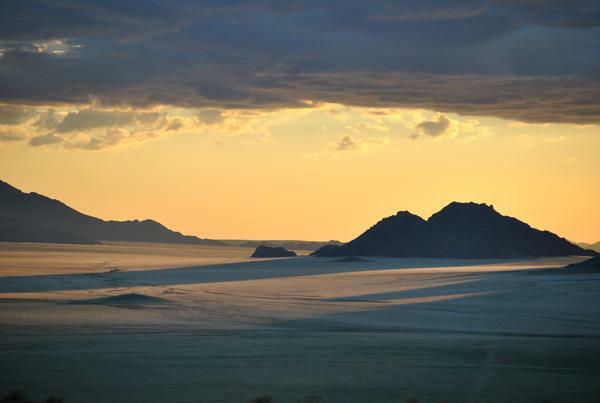 After 3 nights at Etosha, we move to the extreme north-west of Namibia on the banks of the Kunene River. Undoubtedly amongst the most remote camps in Southern Africa, Serra Cafema is only reachable by light aircraft. 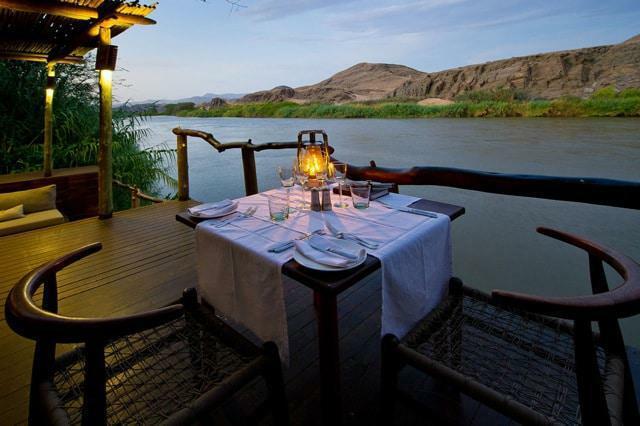 The Kunene River creates a lush oasis along its banks – a winding band of green surrounded by the lunar like landscape of the Namib Desert. Rapids just below camp provide a calming ambiance after a day exploring one of the driest, starkly beautiful regions in the world. Activities at Serra Cafema revolve around the exploration of surrounding Namib Desert sands and the lush oases along the river, a journey of contrasts. Informative nature drives and carefully guided quad bike excursions through the fragile dunes allow guests to experience the true Namib in its unbridled glory. The utmost care is taken to tread lightly on the dunes and preserve the unique and delicate habitats of this landscape. Boating on the Kunene River provides guests with the opportunity to venture through the lush riverside oases. Crocodiles and waterbirds seem out of place in this surreal, lunar-like landscape. Walking in the remote mountain and river valleys is also a highlight, as is a visit to a Himba settlement – one of the last true nomadic people in Africa. This has to be one of the most dramatic places on earth. It is extraordinary that this wonderful lodge even exists here. We then fly to the Hoanib Skeleton Coast Camp, which is located on the Hoanib River in the northern part of the private Palmwag Concession. Its location thus straddles the Palmwag area and Skeleton Coast National Park, in one of the most remote areas of the Kaokoveld. A land of rugged scenery, the area has a historic coastline, mountains, vast plains, and dry riverbeds inhabited by incredible desert-adapted plant and animal life. Despite the arid environs, one of the greatest concentrations of desert-adapted elephant and lion can be found within this extraordinary area – along with sightings of giraffe, antelope, black rhino, leopard and cheetah. 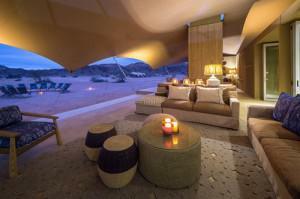 Exclusivity is taken a step further as the camp comprises only seven twin-bedded tents and one family unit. The camp looks out over the stunning rugged scenery and offers guests all the luxuries and amenities needed for an unforgettable stay. In this bewitching and splendid part of the planet, guests can unravel the enigmatic history of the original Strandlopers (Beachcombers), their stone circles lying in hidden valleys, studying the ancient Welwitschia plant, stalking the great herds, or savouring the endless landscapes unfolding – untouched – for hundreds of kilometres. Activities include nature walks, game drives, dune drives, use of hides, exploratory day excursions with picnic lunches and coastal visits exposing the astonishing desert-adapted wildlife, plants and birdlife of the area. 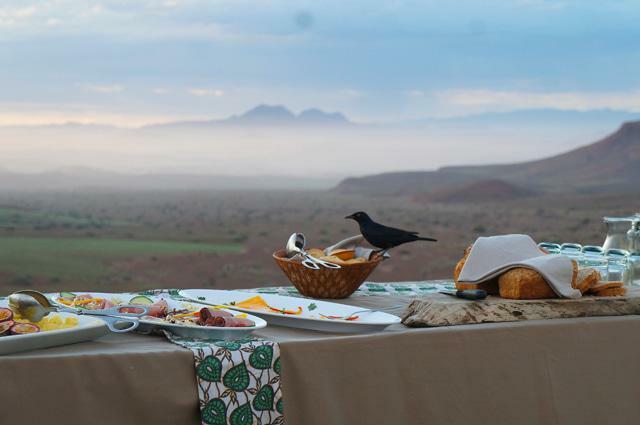 On day 9 we will fly to the remarkable Little Kulula Lodge at Sossusvlei, an extraordinary lodge perched in the desert. 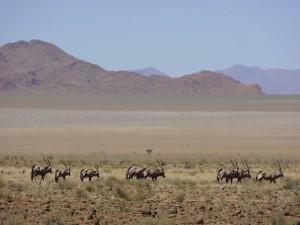 Thanks to conservation efforts, the NamibRand spans 180 000 hectares (445000 acres) of pristine desert wilderness, and is the largest private nature reserve in Southern Africa. In the language of the Nama people of Namibia, the word ‘Sossus’ means a place where water collects. The word ‘vlei’ is an Afrikaans word meaning a depression where water collects. Loosely translated, Sossusvlei means ‘the place where water collects’. Little Kulala is in the private 37 000-hectare Kulala Wilderness Reserve adjacent to the National Park where the famous dunes are located. There are 11 climate-controlled, thatched “kulalas” (the word means ‘to sleep’) which merge impeccably into the desert landscape, each with private plunge pool, and both indoor and outdoor showers. An elegant entertainment area includes a library, wine cellar, craft boutique, lounge and dining areas. Little Kulala’s interiors make use of neutral colours, gorgeous textures and natural light and take its inspiration from its surroundings, notably from the magnificent Dead Vlei. In harmony with its surroundings, this is an impressive lodge both architecturally and for its services. 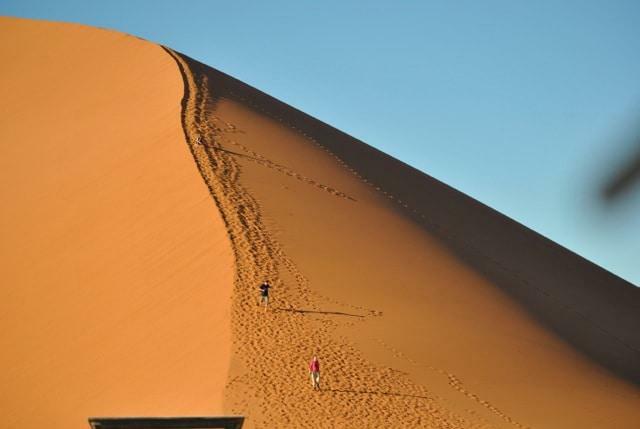 The visit to the tallest dunes in the world at Sossusvlei is an unforgettable experience. A walk up one of the dunes conveys dramatically how awesome this site is. We will also visit the Sesriem Canyon, carved by water over millennia. 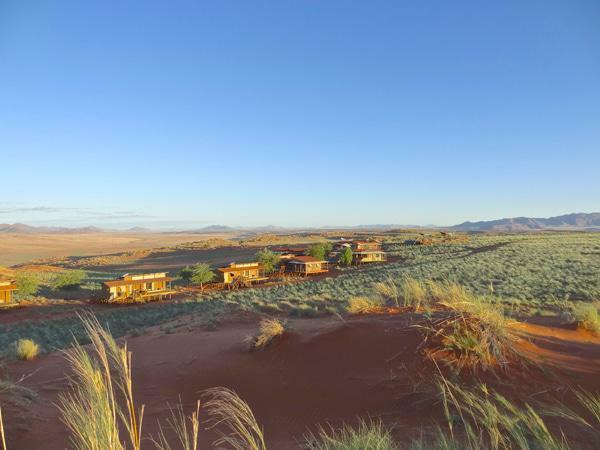 Our final 3 nights will be spent at this remarkable lodge perched on top of a dune plateau, overlooking panoramic vistas in all directions and capturing the beauty of the desert in a most memorable way. This spectacular location comes with all the creature comforts including crisp white sheets, warm down duvets for those chilly desert nights and solar-heated hot showers after a long drive in the great beyond. The camp was constructed using poles, elevated wooden decks and roll-up canvas walls and are driven solely by solar power – ensuring a very light environmental footprint on the pristine desert ecology. The building style is a combination of wooden structures and canvas blinds, opening up to the desert beyond. 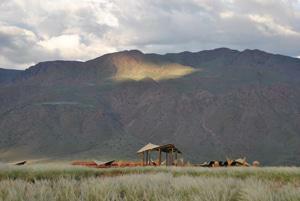 The lodge reflects the ambience of a tented camp, but provides the comfort and protection of a permanent building. Each of the nine spacious chalets with en-suite bathrooms has a private verandah, which connects you to vast stretches of untouched sand. Sleeping with your canvas blinds open is just like sleeping under the stars. The main complex consists of two lounges, a number of sundowner decks, a fireplace, a tea deck, a library, the wine cellar and two dining rooms. The lodge also has a swimming pool, which is suspended above the sand. All communal areas of the lodge open out onto decks with superb views. Sundowner drives are approximately 1-2 hours long, traveling about 10 km into the dunes, where evening drinks will be served while you enjoy the magnificent desert sunset. The return drive to the camp/lodge takes place in the dark, where our desert chefs have prepared a sumptuous four-course dinner for you. Dinners involve elegant table settings, candlelight and exuberant menu announcements in the local Nama language, wholesome and sophisticated ‘bush-cuisine’, prepared lovingly with homegrown organic fresh produce and paired with excellent local and South African wines. Morning or afternoon drives cover a distance of about 40-50 km and take 3-4 hours. Afternoon scenic drives are often combined with sundowners in the dunes. 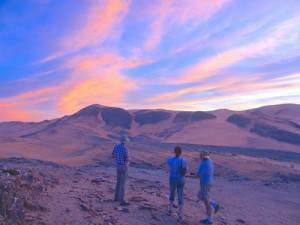 On day 14, sadly we will have to leave this last of our fascinating Namibian sojourns. Our plane will take us in the morning to Windhoek to enable connections to our international destinations. 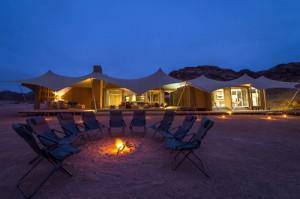 Wolwedans provides the perfect base from which to explore vast stretches of undisturbed nature. Informative scenic drives in open Land rovers reveal the wonders of the wilderness.